Editor’s note: Passport to Cheese is Cheese Market News’ feature series exploring the dairy industries of nations around the world. Each month this series takes an in-depth look at various nations/regions’ dairy industries with coverage of their milk and cheese statistics and key issues affecting them. The nations’ interplay with the United States also is explored. This month we are pleased to introduce our latest region — Middle East and North Africa. MADISON, Wis. — More than a dozen U.S. dairy companies exhibited their products this week at Gulfood, the world’s largest annual food and hospitality show held Feb. 21-25 at the Dubai World Trade Center in the United Arab Emirates (UAE). The show, which boasts more than 5,000 exhibitors representing 120 countries and draws about 90,000 visitors, is testament to the importance of trade relationships between global food producers and buyers in the Middle East and North Africa (MENA) region. Among the exhibitors was Davisco, the U.S. dairy ingredients division of Agropur Inc., showcasing its commodity dairy products and specialty whey ingredients. Davisco sees the most interest by Middle Eastern buyers in its commodity products, which include whey protein concentrate 80-percent and premium deproteinized whey. One of the markets in this region Davisco does the most business with is Saudi Arabia. “I’m always excited to return to the Gulfood expo and meet with attendees and discuss how Davisco/Agropur can meet their whey ingredient needs,” says David Curta, director of sales, Davisco. Milk, yogurt, cream, cheese, butter and ice cream traditionally are part of diets in MENA countries. As global food trends have boosted demand for higher-quality, better-tasting and healthier foods, the wholesome quality of these traditional foods has become more important, says Nina Bakht Halal, Middle East director for the U.S. Dairy Export Council (USDEC). The MENA region is the second-largest dairy importing region in the world and relies heavily on dairy imports as raw materials for production. Agriculture is limited in this region due to lack of water and arable land, and most of the milk produced here goes to fluid and fresh dairy product production. Almarai, based in Saudi Arabia, is the Middle East’s largest vertically integrated, non-cooperative dairy company, and is often credited with the development of the dairy industry within the region, Halal says. The company was founded in 1977 by HH Prince Sultan bin Mohammed bin Saudi Al Kabeer, who saw an opportunity to transform Saudi Arabia’s traditional dairy farming industry to meet the needs of a rapidly-expanding domestic market. Almarai started with fresh milk and laban (fermented milk) processing, and today its portfolio includes infant nutrition, bakery and poultry in addition to its dairy and juice division. The company also has formed joint ventures with PepsiCo and Mead Johnson Nutrition, and earlier this year Almarai purchased 1,790 acres of farm land in California to secure a quality feed supply for its dairy farms. Other dairy companies in the MENA region also have established joint ventures or co-packing arrangements with foreign companies, Halal says, which allows these foreign companies the opportunity to establish market presence and further develop distribution capabilities. There are more than a dozen U.S. dairy companies involved and active in the region, Halal notes, ranging from large and small manufacturers to traders. USDEC works to facilitate these relationships, providing venues that bring together qualified regional players. Demand for dairy in the MENA region is driven by many factors, including a young and growing population, improved access to education, rising incomes, increased focus on health and wellness, and continued foodservice growth, Halal says. Cheese processing is expected to continue growing as major retail chains expand in geographical coverage, space and product diversification. The best opportunities in this region lie in Saudi Arabia, Egypt and the UAE, she says. However, there also is growth in sectors across other smaller but high-value countries among the Gulf Cooperation Council (GCC) countries, including Morocco, which has a free trade agreement with the United States. Saudi Arabia is the MENA region’s largest dairy producer and also the largest importer of U.S. dairy products (see chart). Milk powders, cheese, butter and skim milk powder are among the significant dairy products imported here, while local dairy companies mainly produce fresh and chilled items such as milk and yogurt. Meanwhile, Egypt is one of the biggest and fastest-growing dairy markets, with cheese forming the largest ingredient segment of the dairy sector after fluid milk. Morocco also has a growing food processing industry, Halal adds, but it is a challenging market for U.S. companies due to traditional European influence in its culture and business. The UAE’s dairy sector is marked by high investment and a drive to develop diversified dairy products, Halal says. Dairy demand and foodservice growth are increasing due to its growing tourism industry. Halal notes that the fast growth of casual dining opportunities in the MENA region has increased demand for dairy product imports. Earlier this month, The Melting Pot Restaurants Inc., a U.S.-based casual dining franchise that features cheese and other fondue courses, announced the opening of its first restaurant in Riyadh, Saudi Arabia. Four additional Melting Pot restaurants will be developed in Saudi Arabia over the next few years as part of the franchise agreement with Mira Foods. “As Saudi Arabia’s capital and buzzing financial sector, it made business sense for us to introduce our unique, fondue-style experience to the city of Riyadh,” says Mike Lester, president of The Melting Pot Restaurants Inc.
U.S. dairy exports in the MENA region have been driven over the past several years by growth in ethnic diversity and an interest in introducing innovative products, as well as by growth in the hotel, restaurant and institution (HRI) sector, Halal says. “Development of the HRI sector within the GCC countries has fostered growth for expanding Western restaurants and major international hotel chains, resulting in opportunities in U.S. processed cheeses,” she says. In addition to U.S. processed and specialty cheeses, Halal says there is a demand in this market for high-quality U.S. whey permeate, which is beneficial to the bakery and confectionery sectors. 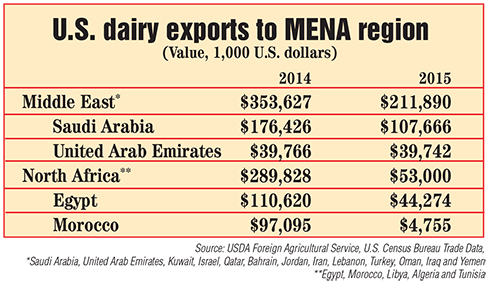 While the MENA region holds many opportunities for U.S. dairy exports, there also is strong competition from other global traders among other unique challenges. “The region faces many challenges, including exchange rates, credit terms, low oil prices, and its proximity to the European Union and the cultural influence the EU has on some of the markets, especially Morocco,” Halal says. In 2015, the United States made significant gains in cheese exports to the MENA region, USDEC reported in its year-end U.S. export summary. However, butterfat exports — which dropped 51 percent worldwide in 2015 — were down considerably in the MENA region at 8,966 metric tons by year end, compared to 43,829 metric tons in 2014 and 58,063 metric tons in 2013. With innovation now a vital aspect for food manufacturing and foodservice, as well as growing demand for high-quality ingredients in dairy, confectionery and bakery applications, the U.S. dairy industry has the opportunity to show its value, Halal says. “It is committed to meeting unique customer needs by fostering partnerships with industry-leading experts and resources worldwide and boasts the infrastructure necessary to yield and expansive supply of quality ingredients,” she says.